The deliciousness of Dover Sole should never be masked by the wine you drink with it. This is the classic fish to be served with Chardonnay or a crisp Sauvignon Blanc. However, when selecting your wine, be careful to choose one that has very subtle flavours – not too fruity. 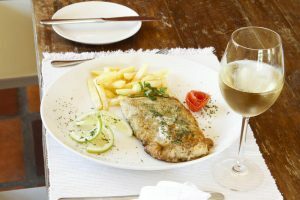 A dry, neutral wine such as Chablis works a treat to enhance the flavour of the fish. OK, so you’ve been taught only to pair fish with white wine. Here’s the exception that proves the rule: freshwater fish, particularly trout and salmon, can benefit from being accompanied by a light-bodied red, such as Pinot Noir. This has lower tannins than most other reds. Pair a Pinot Noir with our oven-roasted salmon, in fresh lemon and rosemary, and you’ll discover hidden depths to both the fish and the wine. With its fruity aromas like peach, jasmine and vanilla, Moscato is usually considered to be a dessert wine. You should try pairing it with our salmon marinated in Cajun spices. Spice and sweet is always a great combination. Savour the salmon, then take a sip of Moscato. The sweetness tones down the spice and adds an extra layer of extravagance to an exquisite dish. Our sea bass, pan fried and served with homemade tartar sauce or lemon parsley butter, can also be paired with Pinot Noir or Gamay Noir, which has a slightly earthy taste with hints of banana and cherry. Gamay is an acidic wine, and will help to bring out the incredible flavour of the sea bass. When pairing smoked fish with wine, remember the adage “smoke with oak”. However, not all oaked wines work equally well with all fish. Smoked mackerel, for example, works with most oaked wines (especially a dry Vinho Verde). Rioja is great with smoked cod. Haddock is far trickier to pair with a wine. In fact, many would say it is best accompanied by water. But there is one wine that heightens the taste of smoked haddock. That wine is a simple Sauvignon Blanc. The go-to pairing for lobster is Chardonnay, but you should consider instead a Pinot Grigio. Its slight acidity acts like a lemon twist on the tongue, bringing out the meatiness of the lobster and helping it to sparkle. It’s a great experience to pair different wines with different foods. Fish has always been the one that has flummoxed many. Move away from Chardonnay! Excite with a different white. Redefine with a carefully selected red wine. If in doubt, shout! Ask me which wine I would recommend for your chosen dish at the table. I’ll be pleased to offer my advice. Our first anniversary celebration is only a couple of days away. We have some very special menu options on the night, live entertainment, and all our guests will be treated to a glass of Cava on arrival. Don’t be disappointed by missing out. Call us on (+34) 600 01 28 24 to book your table for our Anniversary Celebration dinner on Wednesday 28th February.